You are here: REDWOLF > Home > News >News Detail - Free shipping for G&G M14! 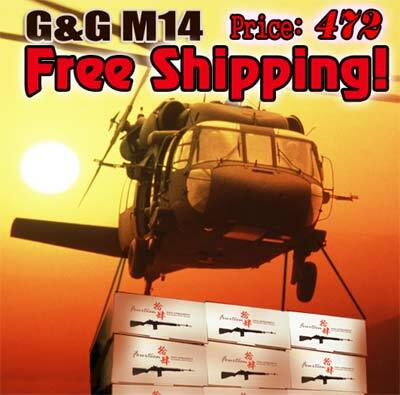 For a limited time only, Redwolf is offering "free shipping" on the awesome G&G M14. You can have this attractive rifle delievered to your door for only $472 with no shipping charges! Extremely solid and high performing, the M14 has been the trusted rifle for US military forces through many wars. Using an innovative gearbox design from G&G, this M14 delivers an impressive 330fps+ of power at high rates of fire that will send your enemies crawling for cover. Huge 470round high capacity magazine means you won't have to stop for constant reloads. And large battery compartment means you can really pack those amperages to run the gun all day without a re-charge. What are you waiting for? Click here to get one now while this offer lasts! Please note that this free-shipping item until 30-6-2005, so please act fast!